NSW Artillery has the longest heritage of any unit in the Australian Defence Force. Colonially trained artillerymen had been used in the defence of the colony from the time of the Crimean War (1854-56). This officer's crossbelt pouch dates to the earliest period of volunteer artillerymen in the colony. The pouch has a black leather body mounted with 'white metal' strap slings. The design on the pouch features three cannons on field carriages, one above the other, all cast from white metal. The field guns are surrounded by a rich wreath of leaves embroidered in silver bullion. The pouch flap is trimmed with silver lace. 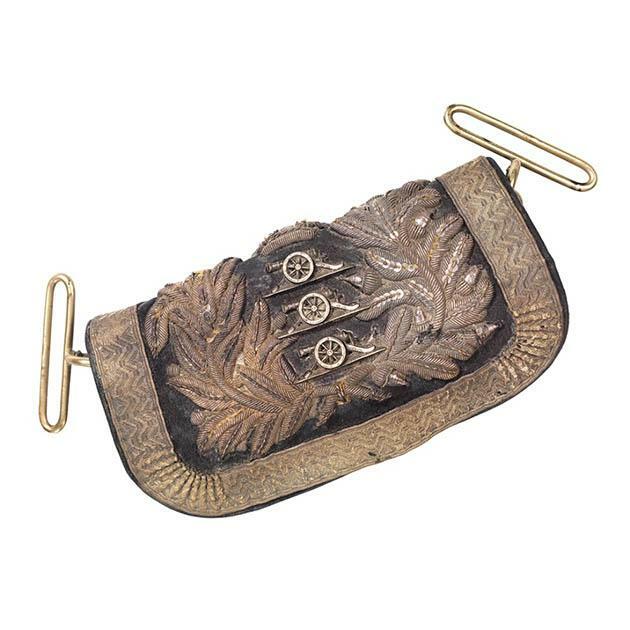 The rich decoration indicates that the officer's pattern crossbelt pouch was a ceremonial symbol of rank rather than having the practical application of its notional use, that is, to hold cartridges for an officer's pistol. Pouches like this would have been worn by officers inspecting or commanding the guns in the colony of New South Wales at battery locations like Fort Denison and Dawes Point or on parades of mobile guns in the Domain or Hyde Park. This pouch is a particularly fine example of its type. The NSW Artillery was a relatively small group of units within the colonial defence forces and its officer corps is likely to have numbered only a few dozen. Therefore this pouch is a rare and significant reminder of the measures the colony took to defend itself as an outpost of the British Empire at a time when gold was our most important export and Britain was at war with the Maori just across the Tasman.